For our first two outings on the boat, our weather has been less than ideal. The water was wavy and the boat was bouncy. It was not the best weather for introducing my parents to the fun that can be had on a boat. 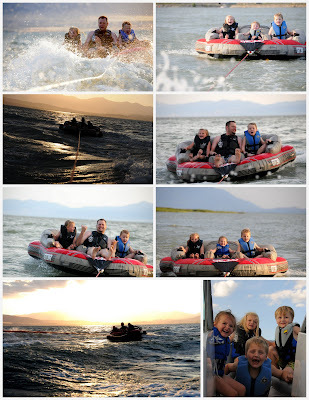 As we bounced and bounced in the boat and Scott cut through the lake, my mom feared for all kids on board. Which meant she stayed in the front of the boat getting the worst bounce, but protected the littles from bouncing overboard. Despite the weather, we had a lot of fun. 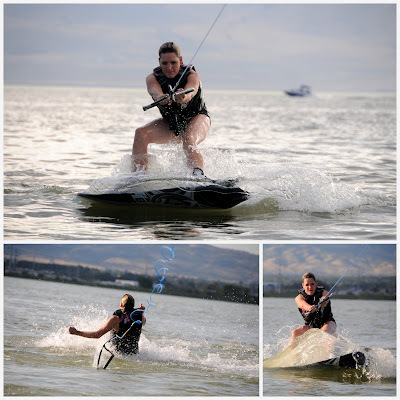 Kat did some wake boarding, but had never had any instruction, other than Scott telling her she'd get the feel for it. She did alright, but I think next time she'll have a much easier time. She's been spending some time watching some videos on YouTube. Plus, she's a natural athlete and can water ski well, I'm sure she'll get it next time around and will laugh that she struggled at all. You should see the bruise that she got that night. She fell off the swim platform and caught herself on the platform. Her bruise is DARK purple and 4 inches by 3 inches. Luckily, that was all she hurt. This was the first time for the tube from Costco. The kids absolutely loved it. So did Jonny. He cracked up at the big kids and their giggles. I have a feeling the tube will get the most water time of anything. Poor mom and dad are still feeling the aches and pains of bouncing around. We'll have to get them out on the boat again during a beautiful and clear night- as opposed to one that threatened a storm.